The current articles in our local papers on test scores being “low” in the higher grade levels at The GW Elementary/Montessori program concerned me in that one might jump to the conclusion that the recent implementation of the Montessori program was unsuccessful. Over the years, I have come to find that what makes something great or not is typically due to its leadership. In the case of The GW Elementary/Montessori program, a unique opportunity is underway for our youth in the hands of Valerie Hannum, one of the more capable leaders I have come across in my time living in Kingston or anywhere. Valerie came to Kingston a little over a decade ago with her family as principal of the Robert Graves Elementary school. As a former Montessori child, teacher and administrator from the Pennsylvania area, she brought her rich background into our public educational system. After ten successful years there, Valerie wrote a proposal for funding to create a ‘Public Montessori’ in Kingston making Kingston 1 in just over 300 in the nation. In what the Legislature reported as being ‘one of the best educational proposals they had ever read’, the monies were approved for a $350,000 start-up in 2008/2009 – just three short years ago! Superintendent Gerard Gretzinger had the foresight to select the GW Elementary School as the pilot for the program. It’s a legacy that he can be most proud of as he reaches his retirement in the new year. Experienced educators, respected and trusted in our community, enthusiastically stepped up to the plate for the rigorous training. To become a certified Montessori teacher is an enormous commitment of time and resources. Pre-K teachers (The Childrens House) requires 1,800 hours of study, while Elementary certification is a whopping 3,600 hours. Pre-school staff have by now successfully become certified, and come November all of the Elementary staff will be fully certified too. With the upper grades having only just begun their transition from public to Montessori last fall, it is obvious that it will require time to implement what is a long term solution to the dilemma of education. In addition, 80% of the children attending the GW Montessori School are eligible for free or reduced school lunches, illustrating that many of the students are at or near the poverty line. With the demographic of the upper grades heavily populated by the poorest of all in the city of Kingston and given the recent economic hardships, it’s unfair to expect that the children “perform” to meet mainstream test requirements. I’m not letting them off the hook by saying so. It’s just that it is far more complicated then simply basing a child’s development on something as one dimensional as test scores in this case. The Montessori method is about making a long term impact. Studies show that Montessori children are well prepared for later life academically, socially, and emotionally. They are ranked above average on such criteria as following directions, turning in work on time, listening attentively, using basic skills, showing responsibility, asking provocative questions, showing enthusiasm for learning, and adapting to new situations. But if it’s test scores that we’re particularly distracted by, missing from these recent articles was that The GW Elementary/Montessori program’s 4th graders scored 87.5% overall in Science. It’s an impressive piece of data proving that the new Montessori materials are making an early impact. One of the primary reasons families choose to live in any community is on the basis of the quality of its schools, and the GW Elementary/Montessori program is the only school in the city with a waiting list. In fact, numerous parents can attest to having chosen this particular neighborhood specifically because of GW’s outstanding reputation far beyond Kingston. Demand was so great last year that another classroom was added to make room in the first weeks of enrollment. An added benefit is that the classrooms are becoming increasingly diverse. Children are exposed to all different nationalities, languages and socio-economic backgrounds. Mixed age classrooms give the older children a chance to act as ‘mentors’ while the younger children benefit to learn from their older classmates. This kind of quality eduction in midtown Kingston brings something that generally is only afforded to children who have the monetary means, as a Montessori education can cost upwards to $10,000 – $15,000 per year, more in larger cities. In Kingston, the school tax is a very large portion of the community’s burden, and it behooves the Kingston School District to heed this trend by not only supporting the GW program for our own children’s sake, but in proudly promoting its asset to attract families to the city as is critical to our overall economic stability. I encourage you to call Valerie who will happily take you on a tour of the school. Better yet, meet her out front of the school on any given morning of the school year where she greets students one by one with a hug or a handshake. You will be amazed at the overall quiet and calm of the students throughout the day that is not imposed by an adult. Instead, you’ll witness the students engaged in their work activities, supported and encouraged to be the very best that they can be. …and listen. Don’t take the Daily Freeman’s word. If you are curious or have concerns – go to the source and get information that way. You – and everyone else – will be far better off. * University of Virginia: Montessori Education Provides Better Outcomes Than Traditional Methods, Study Indicates. 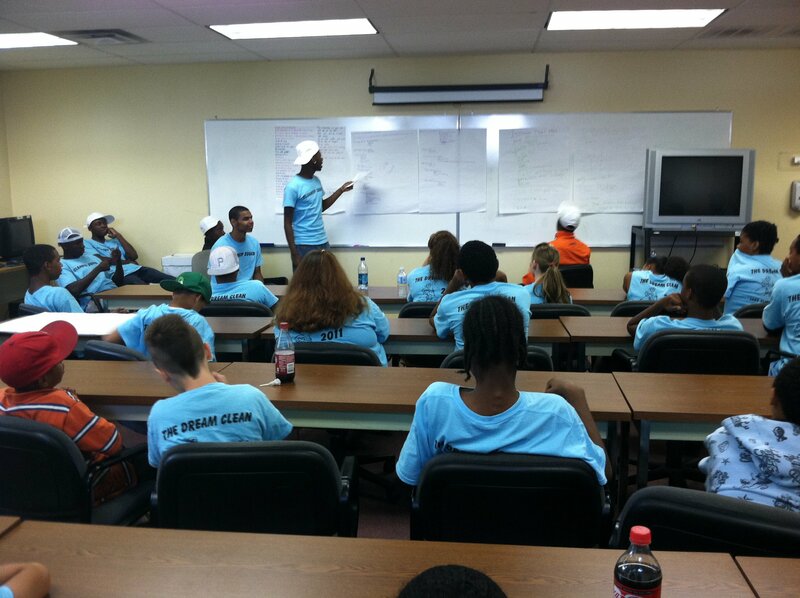 Clean-up Squad Concept Identifies Needs and Helps to Organize Kingston Youth. It’s Really That Simple. Talk about putting your money where your mouth is. Here is a fine and welcomed example of it. 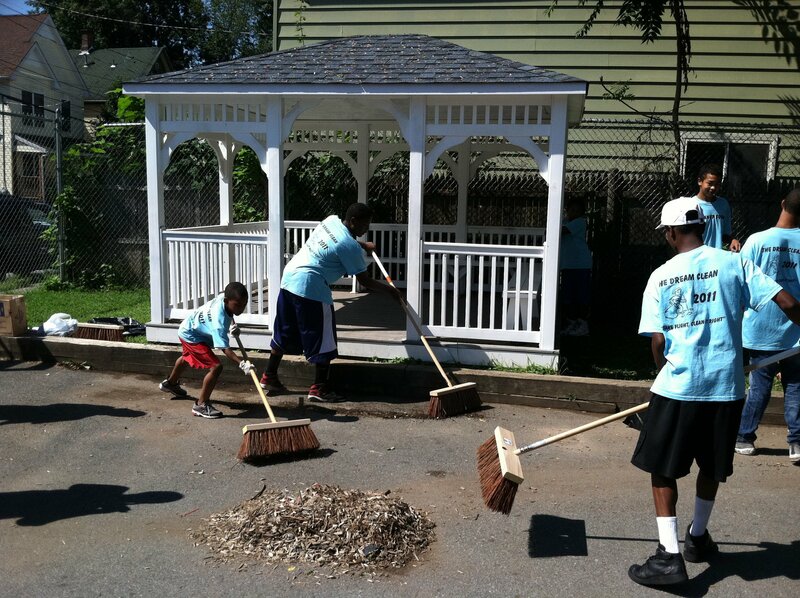 I am so impressed with the recent effort made by Ward 9 Alderman Hayes Clement and Ward 4 Alderwoman Shirley Whitlock. 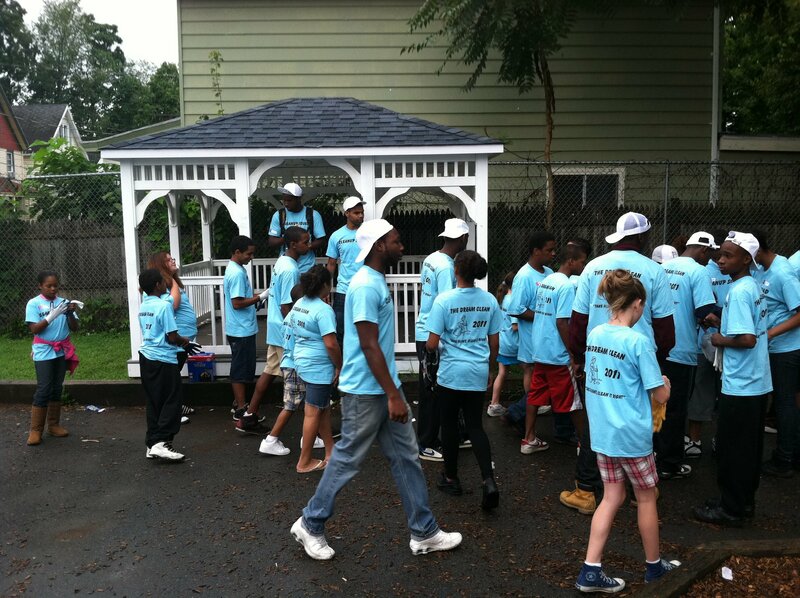 With the support and guidance of Kingston Cares (A program of Family of Woodstock) up to 25 youth have been organized to perform public service work while in return, having a hand in making their neighborhood more beautiful, making a positive impact in the community overall and earning a most valuable $50 gift card for back to school supplies. It’s that simple. Correctly identifying what is needed coupled with little bit of common sense and organization goes a very long way in the short and long term. Below are photos taken from Kingston Care’s website – and the PRESS RELEASE announcing the effort. 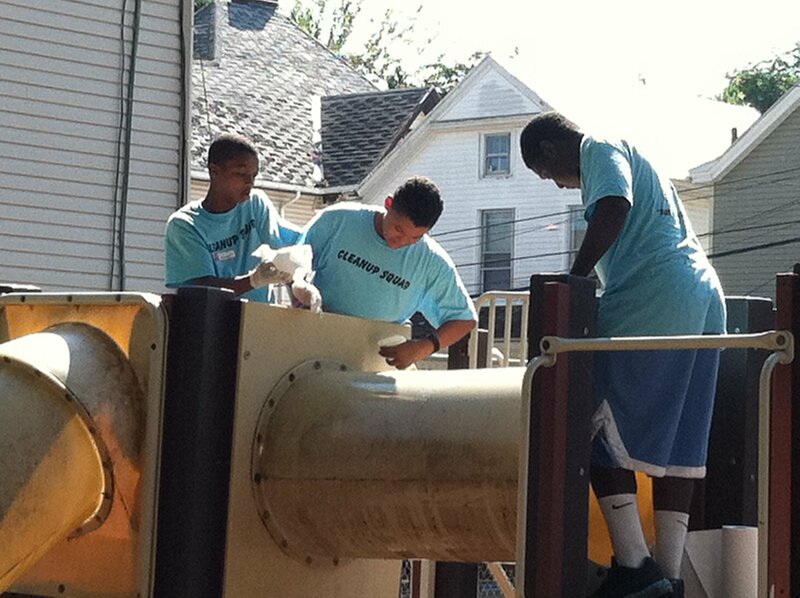 The Clean-up Squad works on Van Buren Park. Graffiti and grit no more. Midtown Kingston Urban Farm Opens Farm Stand. 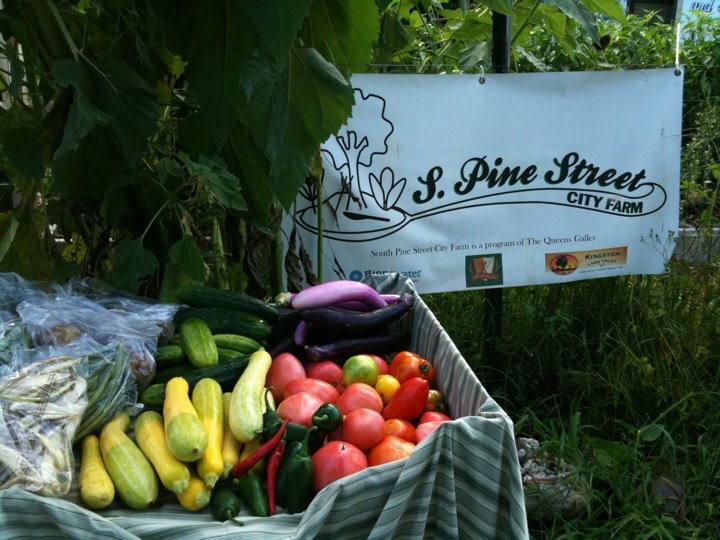 As many know, the South Pine Street City Farm located at 27 South Pine Street off of Greenkill Avenue in Midtown Kingston has transformed a city lot into a farm to help feed the community local, organic vegetables. As of yesterday, Farmer Jesica Clark is offering a ‘farm stand’ where neighbors can purchase fresh from the garden vegetables right at the farm. Her stand should be in place by Friday – and you can bet that come fall, the Kingston Land Trust will do a big push in helping to make it known. It doesn’t get any better than that for a city like ours. Unless, of course, you’re growing your own food yourself. Special thanks to Hugh Cummings of Hugh Name It Builders who donated his time and materials in building the Midtown stand. Benefit Concert for Kingston Cares (a program of Family of Woodstock) at Stella May Theater on Tuesday, August 9th. For years, I have been working with Megan Weiss of Kingston Cares out of the Everett Hodge Center. The garden space in front had caught my attention as a potential location to create a garden to grow food and to use as a showcase in the neighborhood to inspire others who might wish to do the same. Back to Megan. At only 25 years old, she has the wisdom of an elder with the children. I don’t know how many are aware of the impact she has made, though soon I have a hunch that is all about to change. Larry and I were offered a performance as part of Laura Hartman’s wonderful Jazz Series that takes place at Stella May Theater off of Greenkill Avenue right around the time I learned that Kingston Cares was losing its funding come September. I suggested that we do a benefit for them to literally ‘buy’ a little time. What started as a simple concert has now grown due to a relationship struck between Stella May and the Ivan Lajara of the Daily Freeman after the civic engagement panel took place in July. With live streaming of the event being a success, ‘The Freeman Sessions’ was created. I hope you’ll try to make it to support Kingston Cares on Tuesday night – and to enjoy an evening of warmth and music. Thanks to the Freeman Sessions, however – if you cannot get out that evening you can watch it at home. Please consider making a donation. For more, read all about it in the DAILY FREEMAN – an excellent piece written by Paula Ann Mitchell. Free yoga, meditation and T’ai Chi in two of Kingston’s beautiful parks continues with it’s monthly series created by the Kingston Land Trust. Take advantage of spending time out of doors with several inspiring yogis. Free “Yoga in the Park” is offered in two parks by the Kingston Land Trust in partnership with Shakti Yoga Studios, MAC Fitness, Mudita Yoga Studios and the City of Kingston’s Park and Recreation department. The series is held in both Cornell Park off of Wurts Street in the Rondout and the Academy Green Park in Uptown Kingston simultaneously on Sunday August 7th at 10:00am. Kingston, NY– The Kingston Land Trust proudly offers the Kingston community free “Yoga in the Park!” in partnership with Shakti Yoga Studios, MAC Fitness, Mudita Yoga Studio and the City of Kingston’s Park and Recreation Department all summer long.Originally set in Cornell Park and programmed by Shakti Yoga and MAC Fitness with Adult and Youth yoga, the series has expanded to include the Academy Green Park programmed by Mudita Yoga Studios with Yoga and T’ai Chi classes. Both park programs will run simultaneously on the first Sunday of each month June – September at 10:00am. “The big picture here is for the Kingston Land Trust to provide free “Yoga in the Park” in each park in Kingston”, says Rebecca Martin, Executive Director of the Kingston Land Trust. “It is a privilege to work with the many unique Yoga studios in the area and to provide free Yoga or T’ai Chi to residents who can walk to their immediate park space and enjoy a class each month. It is also nice, because it allows the Yogi community a chance to develop a wide partnership base in the city of Kingston. Partnerships are key to any of our success”. About Mudita Yoga Center – Mudita Yoga Center is dedicated to yoga, wellness and community. Translated from Sanskrit, Mudita describes a state of joyfulness, with is exactly what Mudita Yoga strives to cultivate through yoga, meditation, tai chi and a variety of workshops and discussion groups. Mudita has a welcoming and comfortable atmosphere and classes that are accessible to everyone regardless of flexibility or level of fitness. Following a year of intense training in India, Shawn Harrison of Mudita immersed herself in a yogic lifestyle – living, working, teaching and studying at Ananda Ashram in Monroe, NY for four years. Her classes encourage peace and ease in the body and mind by focusing on the breath and relaxing into each posture, creating space to tune in to our natural rhythm.